When rechargable batteries were introduced to me in the late 80s, there were special rechargers we had to buy. It was great because we could keep our batteries instead of throwing them out. Recycling became commonplace, but carrying loads of batteries wasn’t practical. 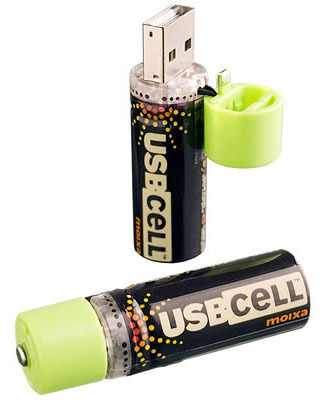 The USB rechargeable battery is nothing short of amazing. You can use it for whatever device you need AAs for, but then recharge the batteries with your computer or portable phone charger (such as the solar powered or bike powered gadgets). I needed batteries for my flashlight and this came in handy. What would YOU use it for?